The Pacific region is highly vulnerable to natural disasters, including in particular tropical cyclones, floods, and tsunamis. A changing climate is likely to increase vulnerability to the impacts. To mitigate and manage the increasing risk, interest in developing disaster and climate change risk financing tools has been growing within the region. Interest was reflected in discussions at the Forum Economic Ministers Meeting and in the establishment of the Pacific Catastrophic Risk Insurance Facility. Efforts to date, however, have focused more on disaster risk financing, with marginal consideration of future impacts of by climate change. At the Climate Conference COP22 in 2016, the government of Tuvalu presented an initiative for a dedicated climate change insurance facility in the Pacific to the Pacific Island countries delegations. From June 26-28, 2017, a 'Pacific Regional Dialogue on Financial Management of Climate Risks’ was convened by the Government of Tuvalu in collaboration with UNDP, the Secretariat of the Pacific Regional Environment Programme (SPREP) and Australian Aid to discuss key issues, needs and support for a Pacific climate change insurance facility. To explore funding options for developing such a Facility. The workshop explored experiences of climate risk financing such as the Caribbean Risk Insurance Facility, the African Risk Capacity and the Pacific Catastrophe Risk Assessment and Insurance Facility including insights into how they function and how they can be incorporated or developed further to assist the proposed Pacific facility. 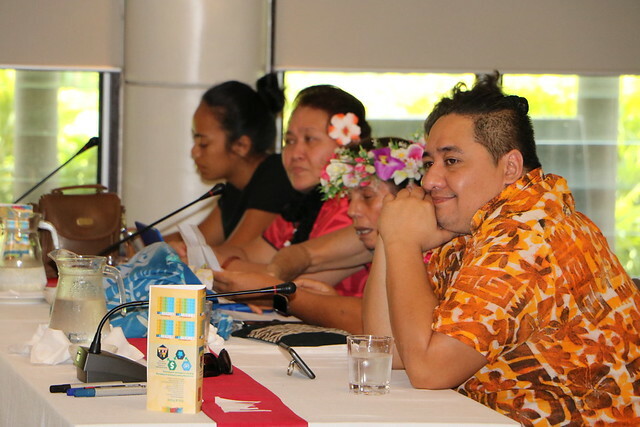 Experiences were exchanged on other financial products that can be relevant in the Pacific. The dialogue also explored the investment potential and usage of the insurance sector in the Pacific, and the opportunities to strengthen the sector to help produce sustainable development outcomes. This included discussions on the opportunities for the sector to support resilience-building measures in the region. It discussed the gaps and challenges that insurance providers face in the Pacific and ways to overcome these. Please click here to download the final agenda. Please click here to download the participant list. 'Climate Insurance Raised' June 27, 2017. Samoa Observer. 'Pacific Dialogue towards climate change risk insurance' June 27, 2017. Scoop NZ. 'Pacific Dialogue in Samoa initiates further steps towards critical climate change risk insurance for the region', June 30, 2017.